In season rates commence June 21, 2019. 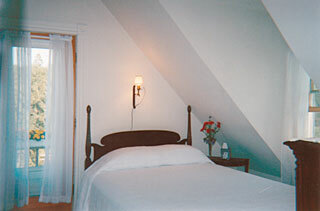 Prior to June 21st most rates are discounted by $20 or more dollars. These rates can be seen on the reservation calendar once you plug in your desired dates. All Rooms Have: new private bathrooms, firm Sealy posturepedic mattresses with down alternative mattress tops, top of the line towels, wireless internet access, air conditioning, and fresh flowers. Absorb feelings of serenity as you gaze upon the sails of the boats passing by your window; the charm of a little island in the harbor and seagulls soaring playfully. This room features antique mahogany furniture, a beautiful queen-sized poster bed, designer chair, oak floor and sheer drapes. Soothe the self with a luxurious bath in a specially designed deep tub in an attractive setting with pedestal sink, cream and rose tile floor, drapes and custom lighting. Experience the fresh sea air, natural sounds and beautiful water views from your own terrace. A french door (private entrance) leads you to this outside seating area which has old fashioned Maine rockers, white wooden table, and flower boxes. Simple and elegant; this room is very light and airy with several windows, French sheer drapes, oak floor, antique queen mahogany poster bed, queen-anne chair and other furnishings. Nicely appointed full bath with gold leaf mirror and brass lighting. 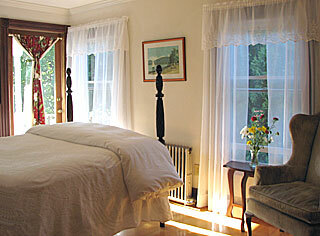 An attractive room offering a lovely king-size high poster antique mahogany bed. The room features mahogany furniture, floor length sheer drapes, oak floor, and custom brass lighting. Your view is of trees, birds, and gardens below. Nicely appointed full bath. 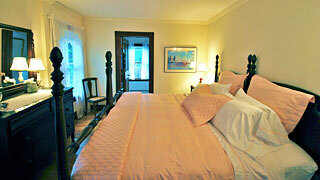 Cozy third level room with a peek of the harbor and private flowered entrance. This is a new room that is small but holds much charm with its interesting architectural design and its ample amount of light and fresh air. 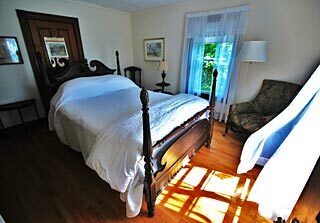 This room offers oak floors, sheer drapes, queen-sized bed, mahogany furnishings, and an attractive bath. Follow the stone steps to your own beautiful and private ocean view retreat amidst the natural surroundings of evergreens, flowering bushes, and a fresh water duck pond. In its origin, a setting to build and repair lobster traps; it has been lovingly renovated to a large sleeping room with white walls, cathedral ceiling, several windows, pine floors and private bath. This room offers lots of light, fresh air, a nice water view, lovely antique oak furnishings including a queen-size bed and presidential rocking chairs. 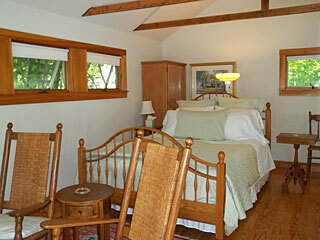 The cottage also includes a Vermont stove for ambiance and a red oriental rug. Outside is a newly constructed porch which creates a picturesque sitting area with its garden, flower boxes, and Maine rocking chairs. Elegance and beauty best describe our newest room. Treat yourselves to this special room on the third level, offering cathedral ceilings, cupulos, and a panoramic view of the harbor. 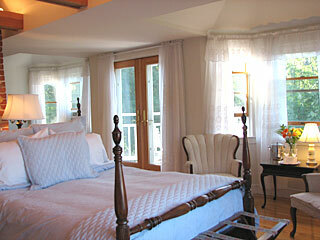 A room filled with light and fresh sea air with it's sixteen windows and two sets of French glass doors. One opens to a lovely whirlpool for two set in three windows, where you can leisurely gaze upon the stars and absorb the beauty and fullness of nature. The other, to your own private terrace where you can relax looking at the water and boats passing by. This room is furnished with attractive mahogany antiques, including a queen size poster bed, upholstered chairs, oak floors, and floor-length drapes. Recommended for honeymoons and special getaways. * Please add a 9% lodging tax to room rates.